For guys always or frequently on the go, whether it be for work, travel, or pleasure, travel shaving products can provide us gentlemen with the ideal comfort. Knowing that we can take our shaving supplies with us without the worry of needing to leave them at home and find different products while we are on the go and out of our comfort zone. Plus, these shaving products meet all federal standards and regulations for travel! Let’s take a look at some of the best shaving supplies for men and see which ones might be the best options for you and your needs! The Braun M90 Mobile Shaver is a well-respected mobile shaver in the industry, being able to travel with you wherever you go. This electric shaver features a wide floating foil that allows for a close and comfortable shave. This electric razor is easily able to be washed with warm running water thanks to the ideal construction of the shaver. Standard on this shaver is a precision trimmer that is able to successfully trim sideburns and mustaches thanks to the extendable long hair trimmer that is featured on this device. Plus, this shaver comes complete with a twist cap to protect the foil while the device is not in use. Battery operated, this shaver runs on AA batteries which are included with the shaver. The Panasonic ES3831K Electric Travel Shaver is a men’s electric travel razor which utilizes a single stainless steel blade and foil that floats along with a strong, tough, durable motor that operates the opportunity for a close, quick, and comfortable shave. This travel shaver features a unique sleek design that is ergonomic, fitting to either hand in a relaxing manner providing ideal comfort and control. Additionally, this design allows for the shaver to neatly fit into any bags, luggage, or grooming kits that you are taking with you as you go. This shaver is 100% washable and is able to get wet, so you can shave either wet or dry, depending on your personal preference. The Panasonic ES3831K Electric Travel Shaver is powered by two AA batteries which are not included. The Philips Norelco PQ208/40 Travel Electric Razor is a razor that is ideal for on-the-go shaving needs, perfect for the traveling man. This electric razor provides a clean shave thanks strongly in part to self-sharpening blades that allow for a close and relaxing shave. This razor features floating heads that are independent of one another which follows the unique curve of your own face itself. This powerful electric shaver is able to shave for up to 60 minutes of continual cordless shave use and is battery operated by two AA batteries which are included with the shaver. The Remington TF70CDN Battery-Operated Foil Travel Shaver is a one-of-a-kind shaver that provides great shaves to every gentleman, each and every time. This travel shaver has many unique features that are special to its operation. The Remington TF70CDN Battery-Operated Foil Travel Shaver has a travel lock to keep you safe while you travel. This secure switch helps to ensure that the razor won’t accidentally turn on during travel, draining the batteries for when you actually need to use it. Even more, this shaver has a built-in cleaning brush that works to keep the foils of the shaver in clean and pristine condition at all times. The cleaning brush is hidden away at the bottom of the shaver, so you won’t even know it’s there! Lastly, this electric shaver, which operates on two AA batteries which are included with the shaver, has an integrated head guard to further protect the shaver’s head during times of travel. This guard fits perfectly over the foils of the shaver to keep everything (and everyone) nice and safe. If you are looking for a multi-functional razor to travel with, the Parker A1R – 4 Piece Travel Safety Razor & Leather Case might be an ideal solution for you. A prime product of the well-known Parker brand, this razor includes a four-piece design with a razor handle that is able to screw on and off, allowing for greater travel ease and assurance. This razor is small enough to travel with but is also large enough to use and benefit from every single day. This razor is built from a solid brass construction and is manually powered, so no batteries or additional sources of electricity are required. Also included with this razor is a brown leather case to hold all of the pieces of the razor at once. The last product we are going to take a look at is the Mini Travel Fusion ProGlide Razor Shaver with Razor Case. This miniature razor is ideal for meeting the traveling needs of the shaving man. This Gillette Fusion ProGlide Razor is of miniature size, making it great to travel with. It can even fit in the wallet pocket of your pants! And with the nice brown leather carrying case that comes standard with the razor, you will be able to take it with you anywhere and everywhere you need to go. No matter your shaving needs as you travel, there are fantastic solutions available for you to help you shave on the go. Whether you enjoy an electric shaver or prefer the more traditional manual razor, there are options perfect for you. 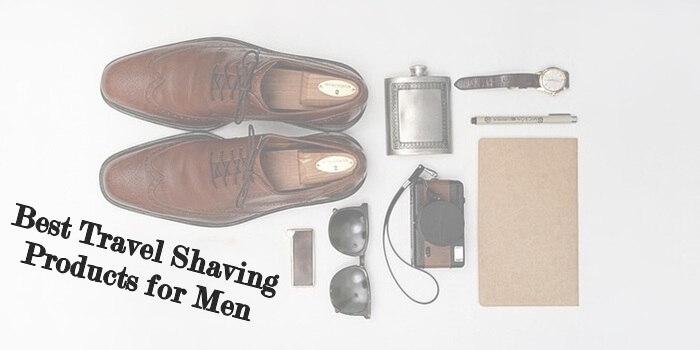 See what will be your best fit and find the answer to your travel shaving needs! A fantastic array of Mini travel razor brands at all affordable prices. A welcome addition to any gentleman’s dopp kit which should fit quite snug. I’m a keen everyday wet shaver so i would more likely lean towards the Parker A1R – 4 Piece Travel Safety Razor & Leather Case or the Fusion Proglide Razor, especially if i’m doing an overnighter or have meetings first thing in the morning. Personally, just a more refreshing option for myself when starting the day. Nifty and impressive article. Great stuff! We are glad to know that you liked our article. No matter the size, a removable razor blade WILL get confiscated by the TSA during your flight travels. Just becasue it is small and lightweight doesn’t mean it is all fine for travel. Of course, you can’t have any razor in your hand luggage. The size matters because it saves the space in your main luggage.